On the mirror, I store my prettiest items- Guerlain Meteorites, Too Faced Sweethearts Blush, Benefit It's Potent! and my Jo Malone jasmine & mint candle which I am yet to burn. The little bunny in the middle was a gift my teaching assistant made for me back in my first year of teaching. In the drawers I store my tweezers, wax strips, glasses and contact lenses. 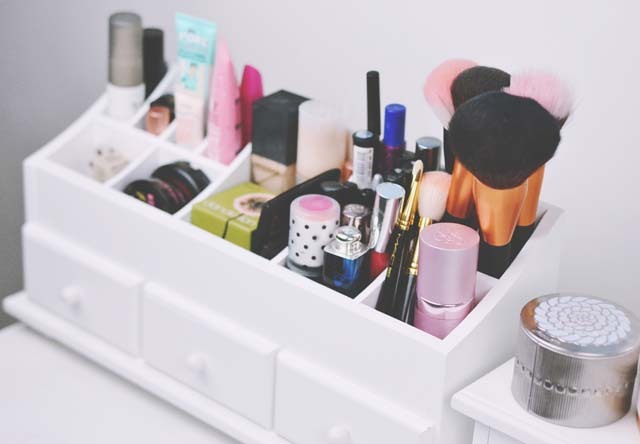 This make up caddy is my favourite thing and I'd have a lot more if I had room for them. (Yes, that's right, with two dressing tables I still don't have enough space!) 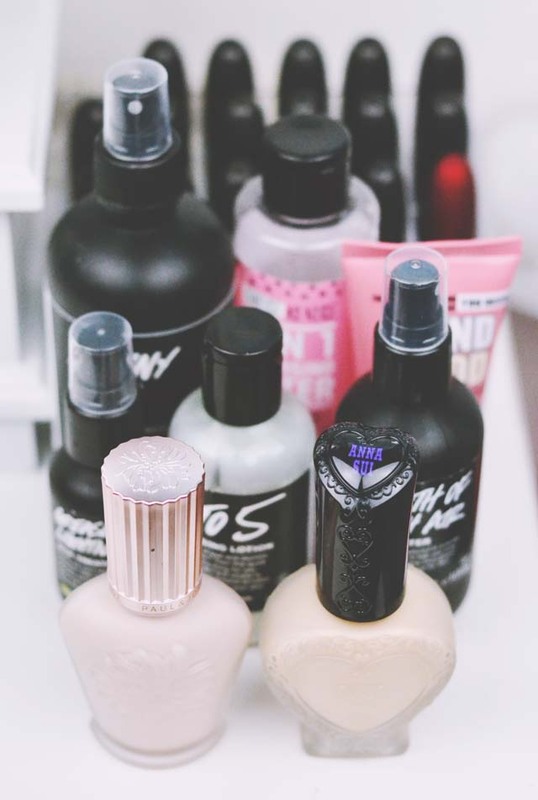 As you can see, I store my high-end products here: primers and setting sprays on the far left, followed by mascaras, foundations and blushers, more mascaras and eyeliners, lip products and finally my brushes on the right. 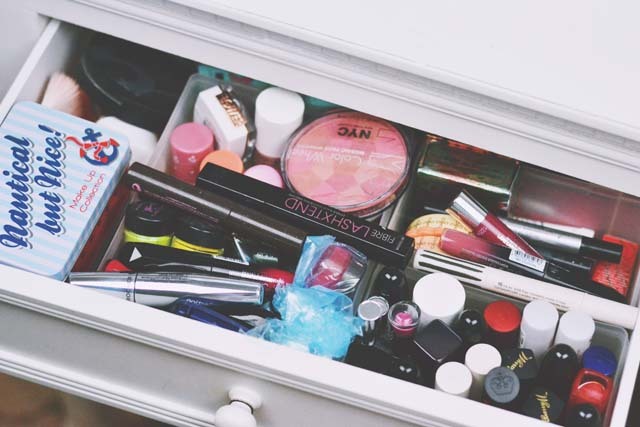 In the drawers, I store lip balms, more eyeliner and moisturisers. To the right of my mirror, I keep my Paul and Joe primer and Anna Sui foundation as they're too pretty to hide away, as well as my cleansers, toners and acrylic storage for my MAC lipsticks. As neat and tidy as my dressing table is, the drawers are another matter. Mind you, as messy as they look, there's still an organisational structure in place. The little box at the front right is for lipsticks, front left is for eye products, back left for blushers and the back right is an overflow box. The gap at the left is used for miscellany that doesn't fit anywhere else. Yeaaaaah... there's no way I can pretend this is organised. 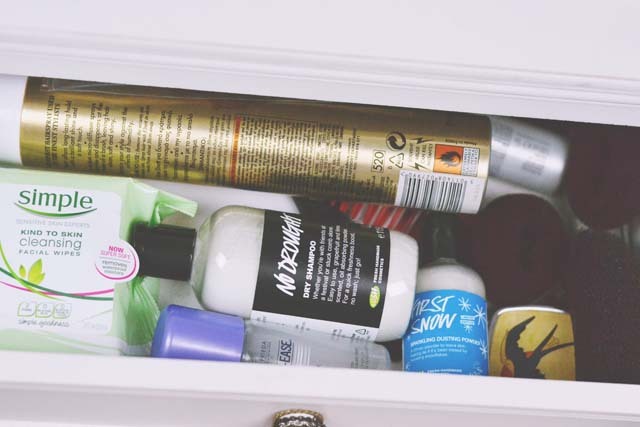 It's just a drawer filled with everything else- make up wipes, hair products, doughnuts and so on. I love the little drawers! I really want to find ones similar to those because the plastic things I have right now get very dirty and smudged with makeup. This so cute - my desk has basically turned into my dressing table, as I'm really bad at never working at my desk... I really should make it a bit cuter! I love the little drawers and the mirror- so pretty! My dressing table is nowhere near as pretty or organised as yours! So adorable! I love Jo Malone's candles I always get them for my mum for presents but I never have bought one for myself! I love your storage! The little white drawer unit is too cute. I don't have a dressing table in my bedroom because I had to choose between that and a desk, I can't wait to have a pretty one when I eventually move out! I don't even really do much make-up/hair on myself but I would loooove to have a cute dressing table like this. 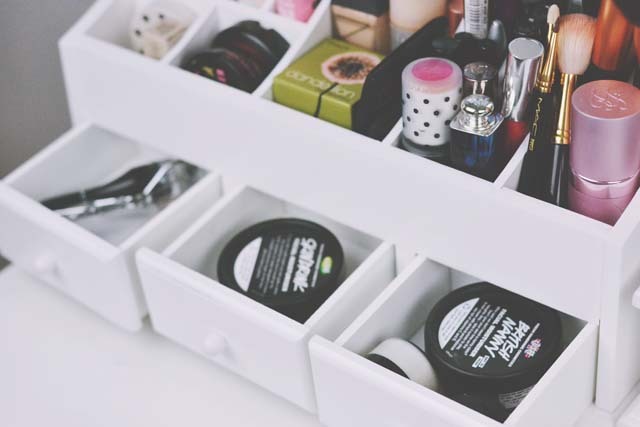 The make-up caddy looks really useful for bits and bobs. 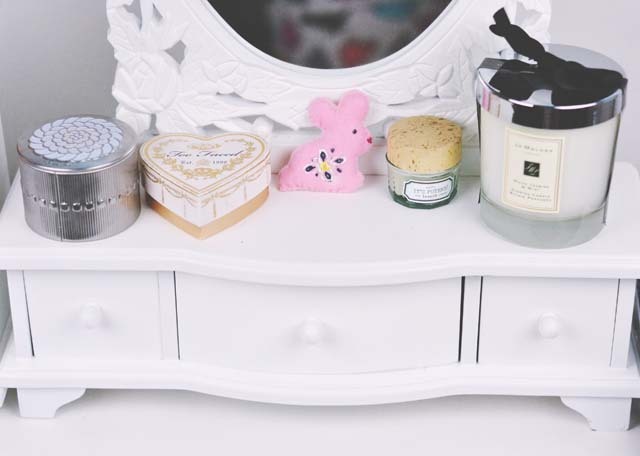 Your dressing table is adorable!